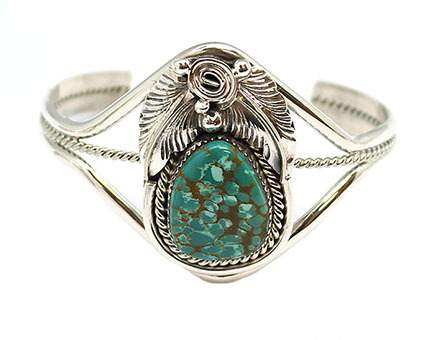 This sterling silver bracelet is made with a free form stabalized kingman turquoise stone and has 2 leaves, curly q's and drops at the top. Each stone is different shape, size and color shade. Top measures 1 3/8" to 1 3/4" long by 1" to 1 1/4" wide. Navajo made by Mike Thomas. Available in blue or green shades. Choose color preference when ordering. Sizes will vary.